Candidates in the 2016 U.S. presidential election use more social networks than politicians of the past, in hopes of tapping the millennial market. However, it's difficult to measure real ROI, and the social trail is fraught with political perils. With the 2016 presidential race heating up, tech-savvy political candidates are stepping up, and executing on, their social media strategies. Since the last presidential election in 2012, President Barack Obama joined Twitter and hosted several chats on Reddit. It's fairly standard today for politicians and their campaigns to have Facebook pages and Twitter accounts. However, for the upcoming election, there are more social networks for campaigns to consider for advertising and outreach, including Snapchat and Instagram. These sites are particularly important because voters, especially millennials, have shifted their social media preferences to video, live streaming and "disappearing post" apps, such as Snapchat. Following the 2014 mid-term elections, 16 percent of registered voters followed candidates for office, political parties or elected officials on social media, up 10 percent since 2010, according to a report from Pew Research Center. Those numbers may seem low, but it's probable that since the report was conducted last year, interest in politicians on social media increased and more millennials and members of generation Z, who are avid users of many social media services, registered to vote. As campaigning for the 2016 election increases, political strategies targeting newer social media sites will surely play a significant role. However, it remains to be seen how exactly how these efforts will influence voters and affect who becomes the next president of the United States. Democrat Hillary Clinton is one of the most prominent examples of a political candidate with a wide array of social media initiatives. Clinton has a strong presence on the most popular social media outlets, with more than one million "Likes" on Facebook and upwards of four million Twitter followers. The Clinton camp also launched accounts on more niche social networks, including Instagram, Pinterest and Snapchat, and even created a Spotify playlist from Clinton that voters can listen to. The mix of social networks the candidate embraces allows for more types of content messaging targeted at voters, including some well-designed, carefully manufactured posts, as well as spontaneous and on-the-fly content — or at least content that appears that way. Whatever kind of post it is, it's probably carefully planned out with a strategy in mind, even if it seems to be off-the-cuff, says Bill Jasso, professor of practice, with a specialty in public relations, at Syracuse University's Newhouse School of Public Communication. "The Clinton campaign has been very targeted and focused on specific issues and specific topics. It has not been a run-of-the-mill, drive-by tweeting type of situation. It looks as though it's the execution of a strategy rather than just random [posts]." 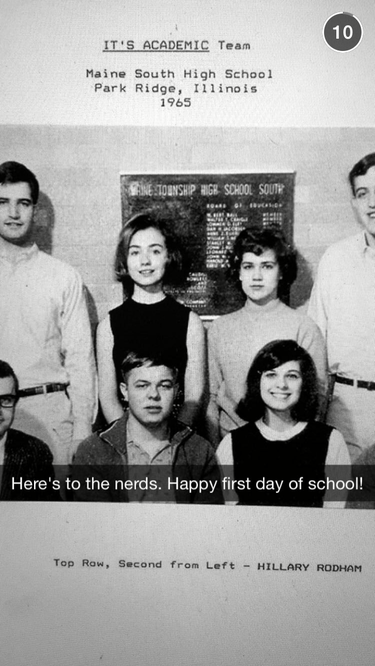 This week on Snapchat, Clinton's team posted a photo of Hillary in high school to wish students a happy first day of school. A post like that isn't meant to be a call to action, and on Snapchat it's not possible to include a link to any campaign-related materials. On Pinterest, Clinton posts images of inspiring women, family photos and pictures from the campaign trail, some of which link back to her website. The goal is to create an image around Clinton, humanize her and make her more relatable, according to Jasso. "Their use of social media has been a good step in softening the image of the former secretary of state." The Clinton campaign team also live-streamed Hillary's first large rally via social-video service Periscope. The rally was a planned and organized event, and the live stream let more people watch and contribute comments in real time. Jasso says the immediacy of social media services, such as Periscope and Snapchat, can sometimes be hard to control, but effective campaign organizers plan things out and stay on-message as often as possible. "The problem with immediacy is that it offers you an opportunity but also a big danger. When there is that break in continuity or consistency, it can be fatally damaging to a candidate." Candidates aren't the only ones putting forth efforts on social. Social media providers are also getting involved and Snapchat is probably the most notable example. Ahead of the Republican Debate a few weeks ago, Snapchat launched a curated "Story" that showed behind-the-scenes clips of the event. Political candidates also launched ads on Snapchat. For example, Republicans John Kasich and Scott Walker both contributed 10-second ads to a Snapchat Story for an Iowa campaign event. And Snapchat hired former CNN political reporter Peter Hamby to be its head of news, to drive its efforts to become a news medium, especially for the upcoming election. "[Snapchat has] gone from being a simple social media toy to now being a recognized news media source of information for many people," says Jasso. "They've captured a niche, they know how to work it and they're doing a very good job of it. They will wind up becoming one of the most significant players." Twitter is also involved in the election and appears to be trying to give politicians more control over their public speech. The company recently shut down two apps that showed politicians' deleted tweets. In addition to Clinton, other political candidates have been making noise on social media. 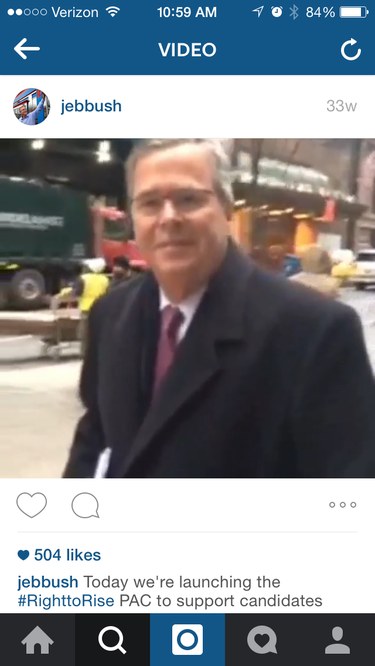 Republican Jeb Bush used Snapchat to announce his presidential campaign, for example, and then promoted the launch of his Super Political Action Committee (PAC) fund raiser with video clips on Instagram. Republican Rand Paul produced ads for Snapchat that discuss his views on the U.S. tax code. And Donald Trump, also a Republican, used Periscope to announce his candidacy. For many candidates, the capability to tap into the millennial demographic is an important component of their efforts on social networks. Millennials are the bulk of users on many of the most popular niche social sites. For example, 71 percent of Snapchat's users are between the ages of 18 and 34 years old, according to comScore. Posting on niche social networks can help candidates stand out to millennials, according to Betsy Sigman, distinguished teaching professor at Georgetown University's McDonough School of Business. Millennials also appreciate photos and images, and these forms of media can make candidates more memorable to people in that valued demographic, Sigman says. If a candidate's message resonates, millennials are likely to share with people in their networks. "It's not just about motivating this generation to vote, but getting their friends to," says Ralph Legnini, senior creative strategist at DragonSearch, a digital marketing agency. "They need to create advocates where one kid will get others to vote." However, millennials don't want social-based political messaging to look like the age-old political ads they see on TV, according to Zach Peterson, chief editor at social media analytics company, Socialbakers. "To break through the noise and make an impact on voters, campaigns need to be original and authentic. Nobody is marketed to like millennials are, and they know when they're being marketed to." It's unclear exactly how all of these social efforts will influence the official nominations for each party and who will ultimately be elected. Right now, it's too early in the game for campaigns to tell which efforts work — and which ones don't. Many of the most significant social initiatives are also probably still in the works, but Jasso says social will be a major part of the election even though it can be a powerful double-edged sword. For many voters, "[i]t's about 'How comfortable do I feel with that particular person? How trusting am I of that particular person? Would I want to have a beer with that person?,'" Jasso says. "Social media is a good way to show that."